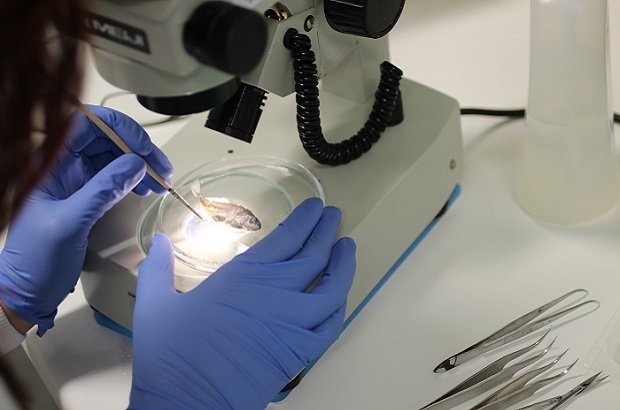 From dissections and fish health checks to fish mortality investigations and talking to fishery owners, no 2 days are ever the same here at Brampton fish lab. People in the industry sometimes refer to us as fish choppers, but there’s much more to it than that. After completing an MSc is Shellfish Biology, Fisheries and Aquaculture I got the opportunity to work for the Environment Agency and have been part of the National Fisheries team for 11 years. It is fair to say that through a combination of the work and the people it is the sort of job that has ‘kept’ me. We are on the frontline here when it comes to protecting fisheries from disease so although at times this can be extremely challenging work, it clearly has its rewards. Whether dealing with established threats such as Koi Herpesvirus (KHV), or new and emerging conditions such as the eel virus, Herpesvirus Anguillae (HVA) or the gill parasite, Gyrodactylus sprostonae, there are always new experiences to be had and more lessons to learn. We’re generally known as the fish lab, and although our work is wide ranging, the majority of what we do here is for still water fisheries. All of our work is funded by rod licence sales. During the cooler months we conduct health checks in support of fish movements. Health checks are done to ensure that fish are fit for purpose, and that they don’t have any non-native, new or novel parasites or pathogens. The Environment Agency controls the movement of fish from waters known to have these pathogens (also known as Category 2 listed diseases) as they can cause serious damage to fisheries. A recent addition to this list is the new and emerging condition, Carp Edema Virus. In summer months, a large amount of my time will be spent investigating fish mortalities where disease is suspected to be the cause. It’s a service that’s funded by rod licence income and provided to all waters that are fished - the vast majority of cases that we see are from stillwaters. By working closely with area teams we can build up a good picture of the fishery itself, and this helps to highlight any management factors that may be contributing to the losses. We’re here to provide support to fisheries, giving advice and guidance to help them get back on their feet and recover, and it’s incredibly rewarding work. Over the years I’ve investigated all sorts of diseases, from bacterial infections in roach, to viral infections in carp, to parasite infections in rainbow trout. In the vast majority of cases though, there’s always something that can be done to help prevent further problems in the future. 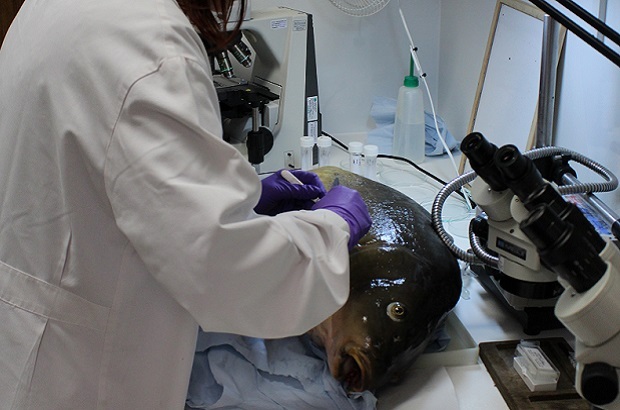 Brampton fish lab is often sent images from anglers of unusual looking fish, strange pathologies, and parasites that they would like explaining or identifying. This can be really rewarding, particularly as it means that I get to speak to people directly, often allaying fears. Most of these requests relate to naturally occurring abnormalities or typical parasites of freshwater fish in the UK. It’s really nice to be able to talk to people about their concerns, and although we might not always have the answer (you can only tell so much from a photograph), we will always try to help as much as we can. For me, being able to engage with people on the subject of parasites is also very rewarding – they’re incredible little beasts, and I could never get bored of them. A recent example of this came from a fishery in the midlands. Images were sent in to us of a stickleback that had been caught with some worms protruding from a rather delicate area... We made a few suggestions as to the likely culprits, and expected nothing more. A few months later, however, the fishery sent us a stickleback pickled in alcohol, suffering with the same problem. We were able to identify the parasite responsible (a perfectly normal, native parasite), and talk through some of the potential reasons as to why it was present in high numbers in that particular water. Interesting and reassuring for the fishery - good for us too! If you have queries or questions about fish you catch or you are a fishery owners with concerns then please contact fish.health@environment-agency.gov.uk. This article was previously published in the Angler's Mail.